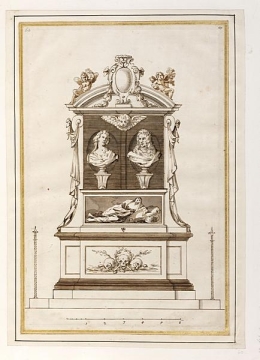 Pen and brown ink with brown and grey washes and brown ink shading, over fine pencil under drawing; on laid paper; 402 x 267; with a separate, inserted section for the relief panel of the sarcophagus and two pasted overlays for the putti on the pediment; laid down on two-part mount, 445 x 317, the inner frame with thick and thin lines in gold leaf, and the outer frame having a single ruled brown-ink line near the edge. The design is for a wall monuments in a railed enclosure, although the railings were not executed (see photographs in Wren Society, XVII, pl. 25). The central dado panel of the pedestal base bears reliefs of skulls, bones and laurel leaves, above which is the sarcophagus panel with an inserted a relief of a recumbent women, emerging naked from a shroud, symbolising resurrection. She reclines on a pillow with tassels at the corners which, appears to rest on a scroll. On the monument itself, this is an inscribed panel, without relief ornament. The busts of John and Ann Withers are set on scrolled brackets against shallow oval recesses within a dark marble backing panel, surmounted by a segmental pediment. A large, strapwork cartouche, draped with swags of laurel leaves, rises in front of the upper cornice, indicating that it was to be tilted forwards, as on the monument itself. Winged cherubs holding flowers recline at each end of the pediment. These were added to the drawing as pasted overlays, drawn in lighter brown ink, and like the inserted recumbent figure, were not executed. The recessed outer bays of the pedestal base carry long concave scrolls either side of the central panel, from which hang knotted drapery swags, symbolising mourning. Ruled brown ink shading over grey-brown wash is used to denoted dark marble for the upper and lower mouldings of the pedestal and for the central panel. Wren Society, XVII, pl. 24, bottom; J. Bettley and N. Pevsner, The Buildings of England: Essex, 2007, p. 91.